Left foot forward (a journey into reenactment): Action! Fame can only await us brave six after our acting endevours on behalf of Horrible Histories! 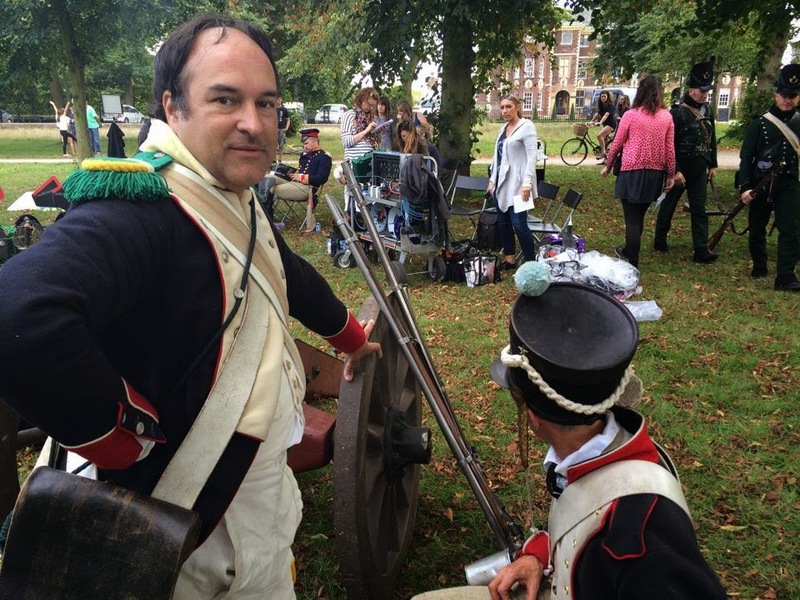 An e-mail had gone out asking for volunteers to appear as extras in an episode of Horrible histories, probably entitled 'Waterloofest'.. which as i'm sure you can imagine is about the Napoleonic era, ending with a news report style battle of Waterloo. The location turned out to be Ham House, in Richmond on Thames. I did my usual early train journey and the only person who sat across from me turned out to be a WWI/II reenactor who I chatted with, until a rather chirpy bloke joined in the conversation and kept asking the same questions and seemed to think we all made a living out of being in films and sleeping in caravans. On arrival I was picked up and chauferred to the location (woohoo!) at Ham House in Richmond on Thames, it was all bigger and more involved than I had imagined, and we met some of the organisers and other folk got kitted up and enjoyed the catering unit/hospitality table whilst we waited. We had six French and six Brits in the end.
'' 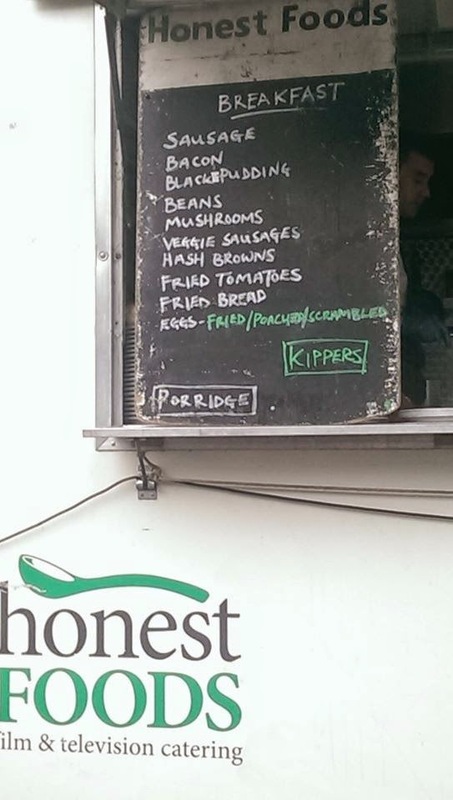 Is that Scarlet Johannson and Robert De Niro having a sausage sandwich?" As if at an event the need to stand around and wait for orders/something to happen possessed us all despite being told to relax and take a seat on the bus. Eventually we wandered off, visiting the house and going down by the river and it wasn't until after a very good lunch that we were called to action. 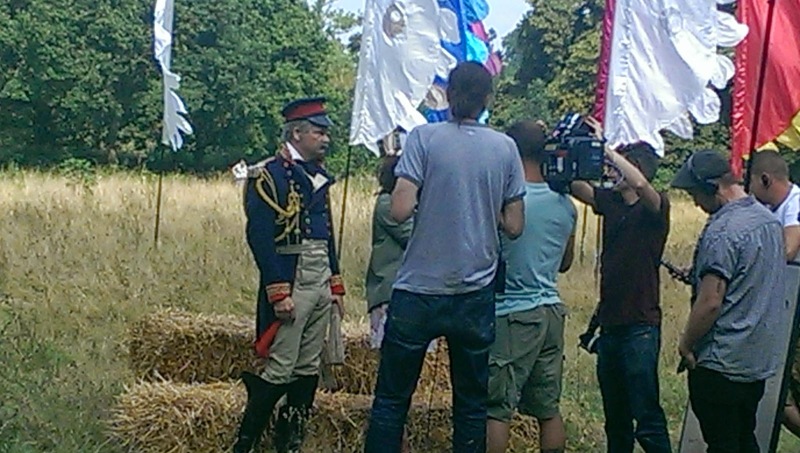 Our first scene was getting ready for battle in the background as Napoleon was interviewed on TV. That was our main function as Napoleon's minions to be in the background shots. Often with only last minute direction and trying to look like drilled soldiers when you realise 'we turn at the end' and no one has clarified which way or what position are we holding our muskets in after that? the Film people didn't care less of course and we all aware of 'Not pointing out historical inaccuracies.. its fun, just be soldiers..' Most shots had 4 or 5 takes, often halting because we were on a major flightpath for Heathrow airport. We pushed a (wooden) cannon about, limped off defeated, cheered Napoleon, marched back and forth, did some cheering.. does that count as a speaking part on my CV? There were a couple of recognisable actor types, Napoleon being played by Jim Howick who was Mark's love rival for Dobbie in Peep show, and regular Horrible Histories actor.. also I have just discovered briefly in Hellboy as Nerdy soldier no.1. As afternoon turned to early evening we moved into the house where filming had been done the day before, well two of us did as evidently this was the last shot of the day. We had our hair done, something to do with not catching the light from the window. 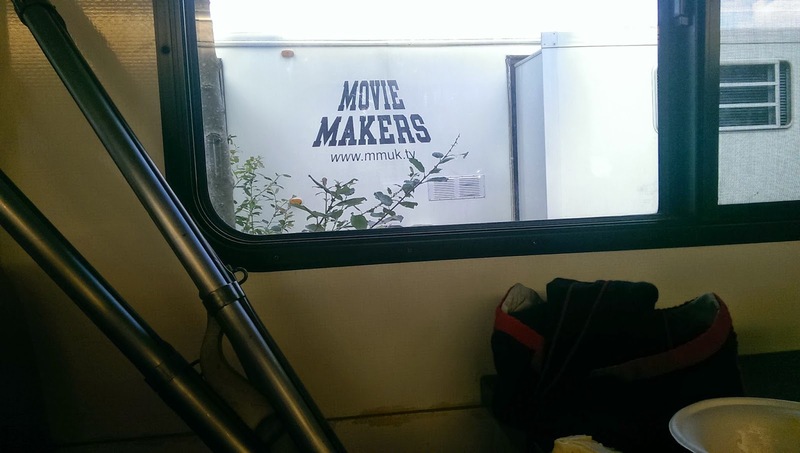 I had to take a message and march out of the office, it is amazing how everyday things like turning round and walking out without catching the back of a chair or looking at the camera suddenly become something requiring concentration. 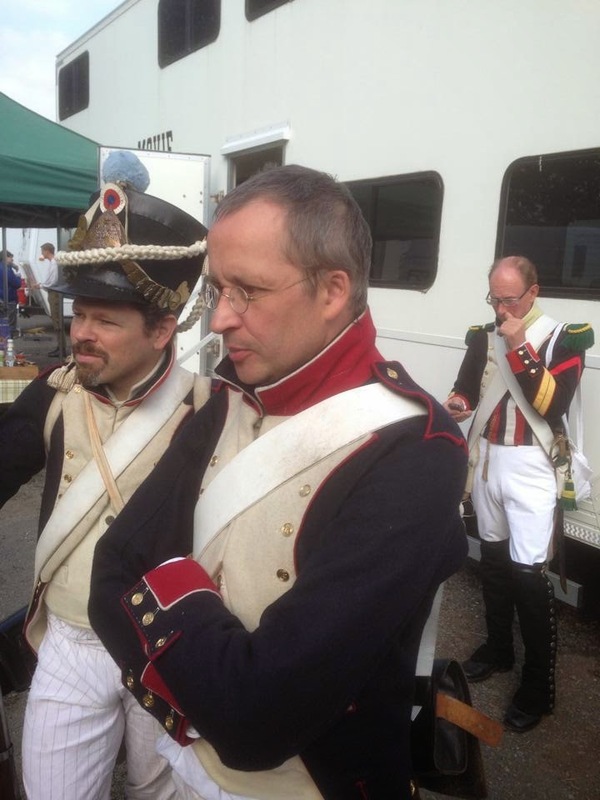 John, who often plays Napoleon at UK events, restraining himself from giving actor Napoleon some tips.